We undertake new, remark and maintenance of all types of pavement markings. 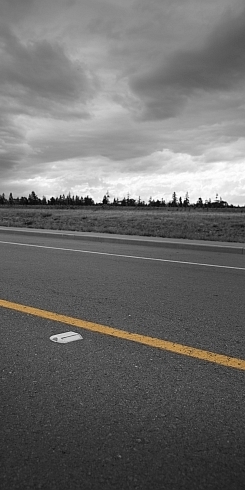 Pavement markings are the only continuous means of guidance for motorists in their travels. We see our responsibility as providing a high quality result for our customer which in turn provides a high quality result for motorists. Industry standards, technology, products and techniques are continuously changing in New Zealand as well as throughout the world. We have people dedicated to keeping up with, training and communicating changes. We paint a range of car parks and factory markings using a number of different products for commercial, retail and industrial business as well as schools. We mark inside and out with a variety of specialist machinery tailored to the requirements. As we have clients all over the South Island, we are often in your area. This minimizes the need for a special trip just to paint your car park, saving you money. Phone us to enquire when we are next in your area. When marking the lines on sports courts and playgrounds, you need a professional’s touch to get an excellent finish that lasts. We know the sizes and measurements of a whole range of sports courts. Talk to us about products that suits your sports ground as these can change depending on the surface as well as how long you want it to last. We can also help design creative playground markings. Spray Marks is a pre-qualified supplier to the Ministry of Education. Our health & safety and quality system are of such a standard that we are on the MOE register as a preferred supplier to conduct on-site works. If you are a school, that makes it super easy to use us. Give us a call today. These are specialized markings to be applied to roads where a traffic safety strategy has identified the need for improved delineation. One of our products, Cold Applied Plastic applied as an Audio Tactile Marking, aims to promote safety by providing a combination of tactile, audio and visual effects. When driven on, vibrations and sound alert the driver that they are crossing out of their lane. Structured markings are used as an alternative to paint in areas where longevity is paramount. This type of road marking was applied by us in Samoa with outstanding results when compared with painted markings. RRPMs clearly define traffic lanes by night and day. If driven across, a gentle thump signals the driver of their error. The Rounds Should (RS) marker was first installed on New Zealand roads in 1987 and this event also coincided with the beginning of Spray Marks as a company. 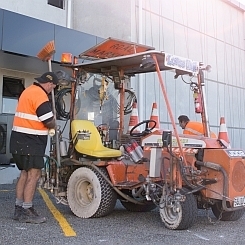 Spray Marks has developed a unique machine for the application of RRPM’s, and since 1987 has been involved in the installation of hundreds of thousands of them throughout New Zealand. We have a dedicated ultra high pressure waterblasting unit (40,000 psi) which travels throughout the South Island undertaking the removal of redundant road markings. There is nothing worse than poorly removed markings which create confusion for motorists. Our blaster is also useful for cleaning up surfaces prior to surface application. Spray Marks has specialised tar flushing equipment designed to remove excessive bitumen from the road surface. Texture on the road surface is what provides skid resistance for motorists, so removing excessive bitumen improves road safety. If you have any roading project, contact us and one of our team will get back to you. We provide a complete spectrum of pavement marking, specialist surfacing and installation of tactile studs and roadside furniture. See our gallery for recent road marking projects. Specialist surfacing is not limited to roads. We have completed many projects in locations as diverse as airport hangers, factories, parks and malls. Spray Marks are a well-established provider for the supply and install of the green coloured surfacing seen around many parts of Christchurch as cycle lanes (G26 Apple Green). Other specialist surfacing examples are Anti-skid paint, coloured resin and aggregate solutions. Various products are available depending on required life and finish required with recycled glass and calcined bauxite featuring as material options. Let us recommend a solution for you. Spray Marks make it really easy by supplying the traffic management and site specific safety plans to ensure the works are carried out safely, effectively and with minimal traffic disruption. All works are carried out to meet the requirements of the NZTA P33 specification with a particular focus on delivering effective skid resistance, and providing excellent day time and night time visibility particularly with the resin and coloured aggregate option. Contact us to find out more. Street Art is a popular and modern way of enlivening public spaces. Spray Marks has completed several street art projects around Christchurch using specialist surfacing. Go to our projects page to find out more. Roadside Furniture is a generic terms for various road related assets, including Bus Shelters, Guideposts, Road Signs, Traffic Lights and handrails. These items are all part of the finishing touches to a roading project. By supplying and installing all types of roadside furniture, Spray Marks is your one-stop finishing contractor. A guardrail is designed to keep people or vehicles from straying into dangerous or off-limits areas. Spray Marks has experience with a range of guardrail products and installation of these in a varied range of locations. We also undertake repairs and replacement of damaged rails. We also offer Road sign installation and maintenance services. To purchase road signs please contact our Graphics department. 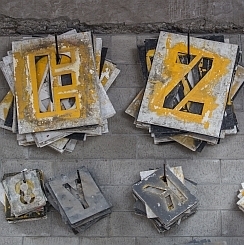 To hire road signs and other Traffic Management equipment. Please see our Traffic Management division. Many farmers also use these marker posts on their property or on private roads. We can supply as well as install if required. Give us a call. We supply and install high premium tactile studs and directional bars. Tactiles are anti-slip products and stair nosings installed in public places and designed to help make the public safer. Generally installed on pavements at intersections, they can also be used elsewhere to improve safety. The system we use has superb UV resistance and excellent aesthetics, so you get a smart looking finish. We have installed thousands of these so you can be assured you’ll get a quality job which lasts.